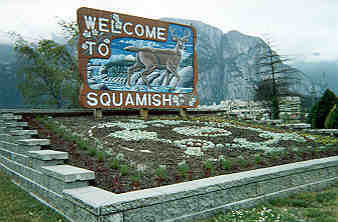 North of Britannia Beach, along Highway 99 in Southwestern British Columbia, lies Squamish, one of Canada's top recreation destinations. Located at the head of Howe Sound, and surrounded by Mount Garibaldi and the granite mountain, Stawamus Chief, Squamish draws climbers from all over the world. The area is also known as Canada's premier windsurfing destination. The surrounding wilderness areas provide abundant choices of recreational activities. Downtown Squamish boasts wide, friendly streets with shops, galleries and restaurants. The town celebrates its lively history with the international Squamish Days Logger Sports, held during August.